Revived by Cat Patrick. Little, Brown and Company, 2012. Currently Available. Face Value: I listened to this on audio book, so I didn’t spend a lot of time with this cover. Which is ok with me, because I don’t think this cover tells you anything about the story, and does nothing to set it apart. Not that good, not that bad either. Does it Break the Slate? For the most part, yes. Daisy, our protagonist, definitely has her Slatebreaking moments. And over the course of the book, as she learns more about her situation, we see her becoming a much more active participant in her own life / lives. There are great depictions of friendships between teenage girls and a significant trans character (without ever being an “issue” book about trans people). Who would we give it to? Finding an audience for this book among traditional speculative fiction readers might be challenging. It reads very contemporary romance in a lot of ways (which isn’t a bad thing). But I think that might mean that there is more readership for this book among Sarah Dessen fans than among Hunger Games die-hards. Review: Daisy Appleby has died five times. Each time, she’s been brought back to life, by a wonder drug, Revive, in a super secret test project. When she was four, she was killed in a bus crash, along with 20 other children. Now all of those children are living in secrecy, part of this big experiment. Daisy’s “parents” are actually agents, meant to protect her and track the success of the project. When she dies by bee sting, they relocate to Omaha under new names. In Omaha, Daisy makes a best friend, Audrey, and falls hard for Audrey’s brother Matt. She starts to put down roots for the first time. But as she does, Daisy starts questioning her circumstances, and what is really at stake with the Revive program. 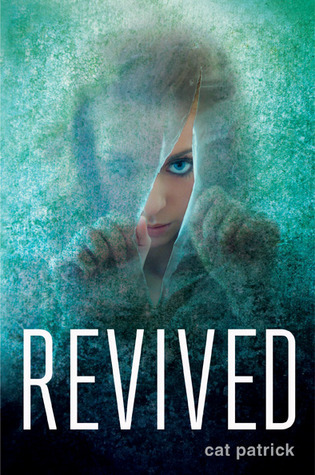 The science of the book doesn’t always add up, and the mystery is uneven – sometimes I was captivated by the secrets behind the Revive program, other times it seemed predicitble and unlikely. The major strength though, is in relationship building. I don’t even mean just the romantic relationship that develops between Daisy and Matt but the friendships and parent/child relationships are well drawn. The friendship that emerges between Daisy and Audrey feels authentic, and I loved reading about Daisy’s relationships with the other “bus kids” she’s grown up with. Daisy’s struggle to determine her identity, given her ever-changing situation is compelling. I also really enjoy when LGBTQ diversity is included in books that aren’t about LGBTQ issues. Meghan, a transgender girl, who was one of the other bus kids, is Daisy’s best friend. Her being trans is a huge part of her character, but it’s not at all what the story is about. It’s great to have her as a supporting character – and it would be even greater to get to hear this story told from Meghan’s point of view. How cool would it be to have a speculative fiction mystery with a trans protagonist! Reviewed from Library copy (audio book). This entry was posted in Reviews, Young Adult and tagged Death, Friendship, LGBT, Mystery, Speculative Fiction. Bookmark the permalink. I’ve read a few reviews that mentioned that the science didn’t add up and the mystery was a bit wonky, so I’l pass on this one. That said, none of them had mentioned a trans character, and it sounds like Meghan was very well written, so yay for that!